Three words… Eat. Less. Sugar. That’s it. If you seriously reduce your sugar intake and exercises regularly, you'll see greater results than through any weight loss tip you’ve ever heard, whether it’s avoiding gluten or eating less bacon. But it’s much easier said than done. I blame corporations, lobbyists and regulators for the difficulties we all face in maintaining a healthy weight. A lot of us try to eat better, but in many ways that’s more difficult to do today than ever before. Sugar is the single worst ingredient in the modern diet. Recent science has demonstrated that fat does not make you fat… sugar does! If you believe sugar should not be regulated, you would have a hard time convincing me why any other substance, whether it’s alcohol, marijuana, MDMA or even cocaine or heroin should be regulated at all. I would argue that today, sugar is far more damaging than all Schedule 1 drugs combined. Sure, sugar in reasonable quantities probably won’t hurt you and natural sugar found in fruits is fine. But, it’s becoming more and more difficult to consume reasonable quantities of sugar. Bloomberg had good intentions by trying to curb the soft beverage intake of New Yorkers. If you want to buy a Coke, the smallest option is a 12oz can which contains 44g (~15 packets) of sugar. Bloomberg was trying to limit the size to 16oz which would be the equivalent of eating 13 sugar cubes. Decades ago, the largest soft drink you could buy was a 7oz bottle. But now, 42oz, 64oz and even larger sizes are pretty standard. But it’s not just soft drinks that are bad. Some so-called ‘healthy foods’ are actually some of the worst things you can eat. Many salad dressings are nothing more than sweet syrups and some fruit juices can be worse than candy bars and donuts. Cereal and many fruit smoothies and yogurts are also loaded with added sugar. Then there’s the fruit that you can order at fast food and casual dining restaurants – they marinate it in high fructose corn syrup! Here are some other foods where the amount of added sugar will surprise you. And it’s all been done because food and beverage corporations know that sugar is addicting and because of the incredible lobbying power of the sugar industry (it is often referred to as the second most political commodity in the world – after oil). Politicians are very sensitive to protecting these businesses, and tailor regimes to do that. Medical research is coalescing around the conclusion that sugar is the leading cause of obesity, type II diabetes and metabolic syndrome. Nearly 70% of US adults are overweight and 36% are obese. There’s a direct link between obesity and heart disease, which is the leading cause of death in this country. Heart surgeons are now speaking out that sugar, not fat, is the culprit for heart disease. Diabetes is the 7th leading cause of death in this country and the #1 leading cause in some countries, including Mexico. 12% of US adults are currently diabetic and that is supposed to increase to 15% by 2020. Maybe even as much as cocaine. Consumption of sweet foods and sugary drinks triggers the release of dopamine in the brain, which is the same response that the brain has to stimulation by sexual arousal and narcotics. We’ve all experienced cravings for certain sweet foods and drinks, even when we are not hungry or thirsty. Also, many (if not most) people who are overweight or obese continue to eat sugary substances even if they realize that it is contributing to their calorie intake and weight gain. Remember that the less sugar you consume, the less you'll crave it. Obesity accounts for 20% of US national health expenditures and diabetes and metabolic syndrome account for a similar figure. That means 35%–40% of healthcare expenditures in the US go to help address issues that are closely tied to the excess consumption of sugar. 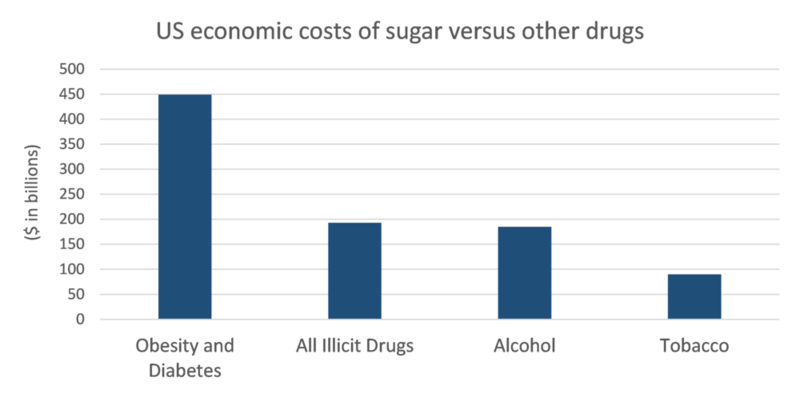 Obesity and diabetes have a combined economic cost of $450 billion annually - greater than the economic costs associated with all illicit drugs, alcohol, and tobacco, combined. Deeming certain drugs ‘illegal’ but imposing no standards on sugar is somewhat hypocritical. Reducing sugar consumption could have the greatest impact on shrinking the healthcare costs in this country – we’re #1 in the world by a longshot and we’re also the biggest consumers of sugar. All Americans would enjoy a reduction in health insurance premiums and less of their taxpayer dollars going to Medicare to treat the sick. Less difficulty maintaining a healthy weight would just be an added bonus. Many statistics used in this post can be found in this Credit Suisse research report. See our Diet Progressions post for tips on waning yourself off high sugar foods.